Tomorrow begins my crazy travel schedule. Tomorrow, it’s off to Gettysburg for the annual muster of the Civil War Discussion Group Online, and a retreat tour on Saturday. We come home Sunday (Susan’s going with me on this one), and then it’s back to Gettysburg again next Friday for the annual conference of the CWPT, where I have a full day tour to lead. Then, we’re off to Middleburg, VA on Sunday night for a memorial for our friend Deborah Fitts, and then home to Columbus on Monday morning. 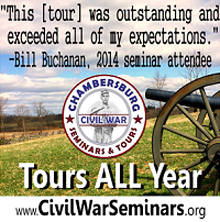 I leave again that Friday, this time for Brandy Station and Trevilian Station, to fulfill a commitment I made last year, when I auctioned off a personal tour to raise money for the CWPT at one of Ted Alexander’s Chambersburg Civil War Seminars. The good news is that these events will provide lots of opportunities to see friends I haven’t seen in quite a while, including Clark B. “Bud” Hall, whom I haven’t seen since he lost Deb last July. Seeing old friends will make all of the driving worthwhile. So, it’s going to be a busy next couple of weeks with way too much driving. I will post when I can, but don’t be surprised if postings are a bit sparse until I get through this craziness. On this Memorial Day, please take a moment and say thank you to the veterans who gave so much to permit us to enjoy the freedoms that we enjoy and who have worked so hard to keep us safe. Thank you to all who have made those sacrifices. I want to give a special thanks to my friend Col. Wade Sokolosky, who is just finishing up a year in Afghanistan. Wade’s son is also on active duty in the U.S. Army. Thank you, Wade. And a special thanks to Sgt. Morton L. Wittenberg, USAAF, World War II, and Gunnery Sgt. Joseph L. Pacitto, USMC, Grenada, Panama, Desert Storm, and Somalia. Dan Hoisington, the owner of Edinborough Publishing, told me tonight that my biography of Ulric Dahlgren goes to the printer tomorrow. That marks the culmination of six long years of work on that project, and it’s the culmination of a labor of love. I can’t wait to see the book in print. It’s due out by the end of June. I will keep everyone posted as to progress, and it will shortly be available for pre-order on my other web site. The Wilderness battlefield cannot be moved. It is a one-of-a-kind place, where tens of thousands of Union and Confederate boys died in the Civil War. You can’t just shift the signs down the road a mile and call another tract of ground the battlefield. But a Wal-Mart shopping center? How special is that? Assuming that what America needs is another Wal-Mart, how hard can it be for corporate planners to choose a location that isn’t within the boundaries of a national battle park? These are the questions being asked by historians, legislators, and preservationists as Wal-Mart plans to build a 138,000-square-foot supercenter on the Wilderness battlefield in Northern Virginia. It would be the fifth Wal-Mart store within a 20-mile radius and a major new commercial threat to a necklace of Civil War fieldsâ€”Wilderness, Chancellorsville, Fredericksburg, Spotsylvaniaâ€”in the area that have already been ravaged by development. In December, a group of 253 historiansâ€”including David McCullough, Ken Burns, James McPherson, and Edwin Bearss, the chief historian emeritus of the National Park Serviceâ€”asked Wal-Mart to reconsider. The Vermont Legislature (the state lost its heaviest casualties of the war at the Wilderness, repulsing a Confederate attack) adopted a joint resolution in February asking Wal-Mart to move its store. U.S. Reps. Peter Welch, a Vermont Democrat, and Ted Poe, a Texas Republican, have led a contingent in Congress urging Wal-Mart CEO Michael Duke to think this through. And the Civil War Preservation Trust put the Wilderness battlefield on its list of “most threatened” battlefields in March. The land that Wal-Mart covets is commercially zoned, but the company needs a special use permit from the Orange County Board of Supervisors, and preservationists are hoping to block the development there. A coalition of local and national preservation groups have offered to pay for a comprehensive, long-range planning study to help local officials. All they need is a little flexibility from Wal-Mart. How about it, Mr. Duke? It’s great to see a credible national media source like U.S. News and World Report weigh in on the issue, and even better to see the editorial take the side of preservation. Hopefully, someone from Wal-Mart will read this article, and hopefully, it will have some impact. Craig Swain and Don Caughey have invited me to join their Battle of Kelly’s Ford micro-blogging data compilation project. I’m pleased and honored to be a part of it. As some of you may know, my 2003 book The Union Cavalry Comes of Age: Hartwood Church to Brandy Station, 1863 contains the most detailed account of the March 17, 1863 Battle of Kelly’s Ford ever published. Consequently, I have accumulated quite a bit of primary source material that will be a perfect addition to the project. I’m looking forward to participating and I’m looking forward to seeing just how much information we can compile. Please check the site regularly. A nonprofit group is working with the National Park Service to keep the historic Electric Map in Gettysburg. Historic Gettysburg-Adams County is talking to the park about obtaining the map and featuring it in a new museum, possibly along Steinwehr Avenue. â€œItâ€™s quite possible that it could be coming out of storage,â€ HGAC President Curt Musselman said Monday morning. Musselman was the guest of broadcaster Fred Snyder during the Breakfast Nook program on 1320 WGET. Musselmanâ€™s group has been working to obtain the map for â€œabout a year,â€ and the group has set up a task force to acquire it. â€œWeâ€™re going to build a museum â€” a map museum â€” making the Electric Map a centerpiece for that,â€ said Judi McGee, chairwoman of the HGAC task force. She promised that the map will be staying in the Borough of Gettysburg, although she did not name specific sites. Steinwehr Avenue businessman Eric Uberman said Monday that he has land beside his American Civil War Museum to accommodate the group. He called the property an â€œoptimum siteâ€ for the Electric Map. â€œWeâ€™re cooperating with them â€” weâ€™re not buying the map,â€ said Uberman. Gettysburg National Military Park spokeswoman Katie Lawhon confirmed Monday afternoon that the park is talking to the group, but stressed that â€œitâ€™s very early in the process.â€ The park has entertained offers for the map in the past, but nothing panned out. Ubermanâ€™s property is located across the street from the entrance to the old visitor center. He thinks that the map would â€œdo wondersâ€ in revitalizing Steinwehr Avenue, which has seen a dramatic drop-off in commerce since the old visitor center closed. The map was cut into four pieces in March and moved out of the old park visitor center. It is now being stored in a park facility along the Hanover Road, just east of Gettysburg. The map was not incorporated into the plans for the new $103 million Battlefield Visitor Center, which opened in April 2008 along the Baltimore Pike. McGee noted that â€œthere are some issues there with asbestos and construction that we need to address,â€ and that talks are ongoing between the federal government and HGAC. HGAC has worked with the Park Service on other projects, said Musselman. The group is aiming to have the map on display again in time for the 150th anniversary of the Battle of Gettysburg, which occurs in 2013. The map entertained millions of tourists over the years, when it was the parkâ€™s primary attraction. It used 625 flashing Christmas bulbs to illustrate the movement of troops during the Battle of Gettysburg. Opponents argue that the mapâ€™s technology is obsolete, while proponents believe that itâ€™s an iconic American treasure. The current map dates back to 1962-63, although the original map dates back to the 1930s. There’s absolutely no doubt that the technology of the Electric Map has been obsolete for years. At the same time, it’s been the first introduction to the Battle of Gettysburg for hundreds of thousands of tourists for decades, and that many have very happy memories of it. There’s also no doubt that it’s been missed by tens of thousands of tourists, including me. I also think that it would help to bring tourists back to Steinwehr Avenue, which would definitely benefit the local businesses. I view this as a real win-win scenario. I certainly hope that this pans out and that the Map finds a home. Even if it is obsolete, it should be on display and it should be available for the world to see. I support it wholeheartedly. Below is the president’s report of North & South, Inc. I recognize that by publishing this report here, I am airing dirty laundry. However, a lot of people are losing a lot of money due to the rank incompetence of the president of the company and his supporting cast of yes-men, far more than I am losing. I simply could not stand by and allow it to happen without the world knowing and understanding that the investors are being stripped of the company’s only asset for nothing but the assumption of the debt by a not-for-profit company that will probably be used as the personal piggy bank of the president. It will come as no surprise to anyone if I remark that U.S. economy is in bad shape. Thus far North & Southâ€™s subscription base has held up and I am working day and night to find new sources of subscribers. We should also have our website back up soon. Retail sales are as far as we know also holding steady (overall magazine sales in the U.S. are down 25%) though there is always so much time lag with the numbers that our data is several months old. (1)	Reduced the number of pages in the magazine from 100 to 84. I have done this in such a way that each issue will still have 5-6 articles, each being slightly shorter than of yore. I am hopeful this will avert any negative reaction from readers. (2)	There will be less color (2 signatures rather than 4). (3)	We have eliminated foreign retail sales and domestic outlets with lower rates of sell-through. This pretty much means North & South will retail exclusively through book stores. (4)	I negotiated with three print companies and finally persuaded our existing printer to meet the lowest bid and work with us in such a way that we can off the unpaid bill for issue 11.2 by September 30th. This means that our bill for 11.3 (which mailed three weeks ago) is reduced to c. $10,000 and from 11.4 on will be c. $9400. This is a reduction from $18,000 per issue. (5)	I have also been able to effect certain other savings. For example, the layout bill is reduced by 16% as a result of reducing the number of pages (though this partially offset by the decline in the value of the U.S. dollar in relation to the Chinese yuenâ€”remember the magazine is laid out in China). The overall effect is that, if no other major problems occur, the magazine will just be able to pay its way. This is just as well, as I can no longer subsidize the magazine or work for a pittance. The company has a credit card debt of c. $100,000 for which I am personally ultimately responsible. Like around 50% of Americans my home is now worth less than my mortgage. Although I am attempting to refinance it, there is a 90% probability that I will lose the house in the next four months. 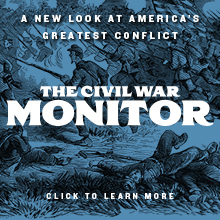 The board of directors has voted to transfer ownership of the magazine to the Civil War Society, which is a not-for-profit corporation. This has a number of advantages (e.g. paying less for illustrations, possibly getting a grant) and stands the best chance of safeguarding the interests of subscribers (as well as relieving N&S Inc. from the subscription obligation of c. $130,000). The Civil War Society will also assume certain other obligations. You should vote for or against this move either at the AGM or by mailed-in ballot. This of course leaves the shareholders–myself included–with a corporation that is effectively an empty shell, albeit one with less debt than before. Our shares at this point are worthless (irrespective of whether the magazine stays with N&S Inc. or goes to the Civil War Society). Intellectually and educationally the magazine has been, and is, a great success; financially it is not. I am painfully aware that friends and acquaintances have invested in the company, though I hope no-one is in as dire a position as I am. I hope eventually to be able personally to repay investors the money they put into the company itself cannot. Obviously this is not a legal obligation, but it is a strongly felt moral one. By the end of the year, if I can stave off personal financial disaster, I may be able to offer you some hope in this direction. Please do not hesitate to call me with any questions or suggestions. So, there you have it. The whole ugly truth. If the proposal is approved by the shareholders–since Poulter and his ex-wife control enough shares, it inevitably will be–we will be left with a corporation that has no assets and nothing but debt. Poulter’s rank incompetence, with the rubber stamping of his board of yes-men, has caused a LOT of good people to lose a LOT of money. In my case, it’s about $20,000, gone forever due to his horrific mismanagement. All lost for the retirement of some debt. It bears noting that this is now the SECOND publishing venture of Poulter’s that his incompetent management ran into the ground; had I known that another venture of his had failed before hitching my wagon to North & South, I never, ever would have done so. One other observation is pertinent here, as to the bankruptcy of Names and Addresses. Poulter very disingenuously would lead us to believe that the alleged $12,000 lost here would tip the balance. He seems to be saying that this tiny straw broke the company’s back, and worse, he’s using it as one of two key reasons for this bogus transfer to the Civil War Society. This fails to pass the old reliable smell test and comes across like an emptyâ€”and transparentâ€”excuse. I have voted against the proposal and against the current slate of directors, and I urge EVERY shareholder of this company to join me in doing so. We may not control enough votes to prevent it, but perhaps it will send a message. Greetings from my home town of Reading, PA. Susan and I are here visiting my parents for Mother’s Day. I spent much of last night and a big chunk of today going through the Dahlgren page galleys, which is the last step before the book is sent to the printer. To my surprise, it turned out to be a 300 page book before the index, which hasn’t been prepared yet. 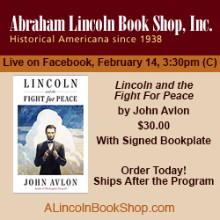 When I started on the project, I never dreamed that I would be able to get a 300 page book out of the life of someone who was killed three weeks before his 22nd birthday, but Ully Dahlgren packed so much living into his 21 years and 11 months that it actually wasn’t all that difficult to do. The galleys look really good; Dan Hoisington has done a good job with it. My only complaint–not a large one–is that I provided him with more than 40 illustrations, and he’s only used about 20 of them. I’d like to see them all in there, but I do understand page constraints and I do understand budgetary constraints. Anyway, Dan tells me that the book will be out by the end of June, so those of you who’ve been waiting patiently for it, you have only a few more weeks to wait before being rewarded. I will finish with them tomorrow and they will then be on their way back to Dan for final revisions and indexing. After 18 months of waiting, we’re almost to the finish line….. Since yesterday’s post has been so well received, and because reader Don Hallstrom asked for it, here’s a list of biographies that are needed. Again, these are in no particular order, and I hope that you will all pitch in as you did yesterday. Those are the ones that come to my mind. Have at it. Perhaps we will inspire someone to take on one of these projects.